Shopping for Disney Fairies Film Cells? Own a piece of Tinker Bell and the Great Fairy Rescue! 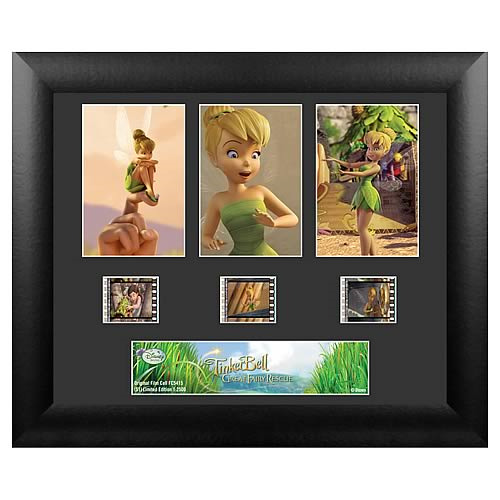 Features Tinker Bell herself, beautifully mounted and framed! Limited to just 2,500 pieces worldwide! This amazing film cell features prints and actual cells from Tinker Bell and the Great Fairy Rescue. Measures 11-inches tall x 13-inches wide. Perfect for displaying in your home or at the office, all the elements are framed in black wood and includes a certificate of authenticity. The Never Land fairies arrive in the English countryside to bring summer to the mainland. An eager and curious Tinker Bell follows the first automobile she has ever seen and observes two humans, eight-year-old Lizzy and her father, arriving at an old farmhouse for the summer. Before Vidia can warn Tink, Lizzy appears and rushes off, with the terrified Tink trapped inside the fairy house. The lonely little girl and Tink slowly bond as each teaches the other about their separate worlds. While her fairy friends battle the elements and an angry cat tries to get to her, Tink tries to fix Lizzys broken relationship with her father by risking her own safety. In the end, all the fairies and Lizzy make a dramatic flight to London to save the future of fairykind.